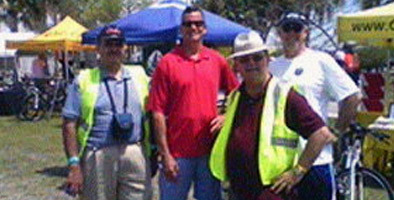 Pictured above at the 7th annual Bicycle Bash (from left to right) Ride of Silence organizer Jose Menendez, MPO Chair County Commissioner Mark Sharpe, BPAC Chair Jim Shirk, and the Sierra’s Club Phil Compton. Tampa Bay’s seventh annual Bicycle Bash, held April 6th at Cotanchobee Park in Downtown Tampa, featured awards for several local cycling heroes. Two of those recognized were Hillsborough County Detective Jennifer Shelton and Assistant State Attorney Barbara Coleman, who have been responsible for bringing dangerous drivers to justice. Nancy and Gary Chapin of St Petersburg were recognized for hundreds of volunteer hours keeping the Pinellas Trail safe and clean, and Chip Haynes of Clearwater for his tireless advocacy, including his book, The Practical Cyclist: Bicycling for Real People. Felicia Leonard, with the City of Clearwater, was recognized for including cycling in the city’s many parks. The awards and the event were presented by the Southwest Florida Bicyclists United with Dealers to celebrate and raise awareness of cycling in Tampa Bay, where over 9,000 commuters use a bicycle for transportation every day, said SWFBUD spokesperson J. Steele Olmsted.